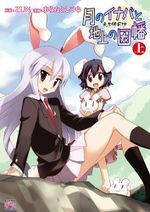 Reisen and Tewi on the cover of the first volune of Inaba of the Moon and Inaba of the Earth. Toshihira Arata (あらたとしひら) is an artist who occasionally draws illustrations of the Touhou Project. He created his own circle called Nhd!, however, nothing seems to have been released under this circle. He is responsible for illustrating Inaba of the Moon and Inaba of the Earth. This page was last edited on 7 February 2015, at 17:14.